During Mr. Seesions recent visit in Sacramento, CA he also filed a lawsuit on the State of California as the 3 state laws geared toward California's being a Sanctuary city prevents cooperation of local enforcers with Federal authorities. 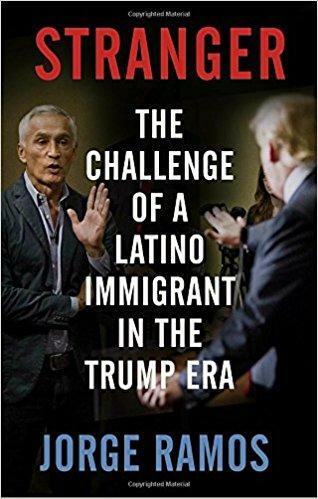 Jorge Ramos examines the latino immigrant in his new book, Stranger, The Challenge of A Latino Immigrant. The book's first chapter starts with "Get Out of My Country" quoted from Trump supporter during a past rally. It continues on the instance that the author was trying to ask then candidate Trump as a journalist. Ramos explains that his issues started in New York when the Trump campaign was launched in 2015 when there was a reference to Mexicans not sending their good people but those with problems. This first statements made the ball rolling for the author as a latino immigrant while remembering certain instances when his employer Univision cut ties with the Trump organization in 1984 on the Miss USA pageant. The author explains on hatred and statistics over the years in terms of immigration and deportations. At some point he touched on the previous Obama administration also being extremely focus on deportation with the exception of the DACA or Dreams enactment that Mr. Obama signed as an Exceutive Order. Immigrants living in the United States as mentioned in the book goes through a lot of lifestyle and cuture changes in order to integrate to society. The mere fact is that any person who was born outside the United States will have to culturally and socially adapt when they arrive in America. Even the so called dreamers at some point had some experience on a change although not much significant for them to recall especially if they came to the US as a child. The author cited on an interview in August 2015 with NBC by candidate Trump on the 11 million undocumented immigrants to either leave the country or be deported. Although the candidate Trump mentioned the removal proceedings may take from 18 months to 24 months, a businessman turned politician is almost like starting pre-school in such complicated policies and rule of law. As seen in the recent actions of the Applelate courts, the DACA which should have stop by now by the Executive branch has been upheld. This just validates how complicated this issue is and thankfully we have the seperate branches of governance. Although, I share the sentiment of the author in his words the latino immigrants in the Trump era can be labelled as "discriminated minorities", the other side of the reality is that we are on a democracy. As such regardless on our racial background as immigrants, we have rights and there is such thing called "due process". The lawsuit filed by the Attorney General against California is expected to reach the United States Supreme Court. With the all the previous Commanders' in Chief including this one, immigration has always be on their agenda. The last time the INA was revised was in 1996 and it took so much effort and yet the system is still broken as such. Immigrants place a vast role in the American economy and workforce and as the author mentioned how many and how long will Boeing 747's have to transport back the 11 million undocumented to their native countries. It's been a learning process for the President on his first year in office. It might not be possible to change his views and perception on the subject but for sure, it would take all the branches of the government to overhaul the immigration system. And just like any complicated case in the court system, it will be quite a while to realistically obtain the absolute results.